"I worked like a dog on City for Conquest. 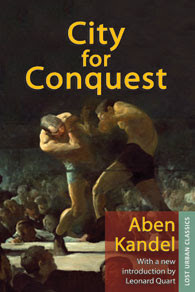 There were some excellent passages in Kandel's novel, passages with genuinely poetic flavor, and all of us doing the picture realized that retaining them (as we were doing) would give City for Conquest distinction. Then I saw the final cut of the picture, and this was quite a surprise. The studio had edited out the best scenes in the picture, excellent stuff, leaving only the novel's skeleton. What remained was a trite melodrama. When I realized what they had done I said to hell with it, and that cured me of seeing my pictures thenceforth. I even wrote a letter of apology to the author. Yet City for Conquest did well at the box office, which ought to prove something or other." When I first read those words in the Cagney autobiography years ago I was puzzled and disappointed. City for Conquest was one of my favourite Cagney pictures. I felt deeply the emotions of the characters and have come to truly love the performances and story. Just how much better was the novel - or was it a case of, for Mr. Cagney, the novel experience surpassed that of the film. It is often that way with fans. "Kandel's theme in his words, was "There's no welcome in New York - no farewell ... The city is deep and high and angry. Come in and you're swallowed. Leave, and you're not missed." But there was also a feeling of love for the city that gave the different stories a unique vitality." I found the novel a fascinating read. Beginning at the early part of the 20th century the different neighbourhoods of NYC are painted through strong imagery with an unblinking eye toward the tawdry lives lived in poverty and the tawdry lives lived in wealth. Sights and smells combine with emotion and harsh realities that filled me with pity and curiosity. The view of the characters may be in the abstract, yet in some instances there is the heavy sting of judgment; in others, a detached understanding. So many plots and characters round out the story of City for Conquest that truly a television mini-series would be the only film form to attempt to give it full justice. Kandel's work as a screenwriter ranges from Magnificent Obsession and They Won't Forget to I Was a Teenage Werewolf and Trog. His novel City for Conquest was his most lauded venture. The subplots selected by Warner Bros. studio to focus on for their adaption perfectly suited the skills of their leading players and the audience's expectations of those stars. 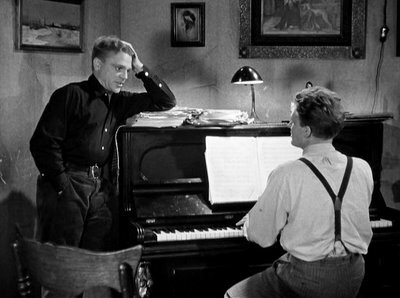 Cagney plays a guy who grew up tough in a tough town. His fists are his way out of the grind and up to the top. 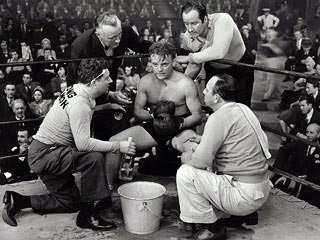 The fight game is shown to be crooked and Cagney's Danny Kenny lacks the single-minded ambition necessary to truly succeed. It is for others that he puts himself in the ring. In his film debut Arthur Kennedy (5 time Oscar nominee) is Danny's brother, Eddie. Eddie is a sensitive soul, a musician who sees the world around him not only as it is, but as a symphony that he must write. Danny doesn't quite understand Eddie, but he loves and admires him. He fights so Eddie can have his dream. Ann Sheridan plays Peggy Nash, a girl who loves to dance. She loves to dance for her own pleasure and for an audience. It is the dream of many in this town to have their name in lights. Peggy hungers for that with all her being. Danny fights so he can share in Peggy's dream. "It is quite apparent that Wexley knows nothing of show business, of what went on during the period covered by the script and apparently knows less about the fight business. The dialogue throughout is completely phoney and will have to be redone if there's to be any honesty in the finished production. The fact that it is still interesting speaks more than well for the Kandel yarn." The shooting script was doctored by Robert Rossen (A Walk in the Sun, The Hustler). 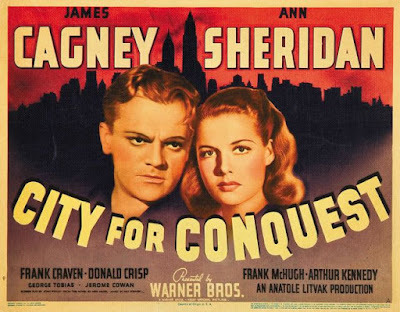 Cagney was also disappointed that the studio replaced Raoul Walsh (The Strawberry Blonde, White Heat) with Anatole Litvak (Out of the Fog, The Snake Pit). Cagney's no-nonsense approach to his work clashed with what he saw as Litvak's artistic pretensions, and the creation of a hierarchy on the set which placed labourers on the bottom. The movie follows the rise and fall of these characters scrambling to get out of desperate situations. Lessened in attention given from the book to the movie is the character of "Googi", a poor kid who learns early that crime is the way to beat the odds. He is important to the plot of the film and played by Elia Kazan with great verve and awareness. The film is a nice showcase for Anthony Quinn, another younger actor starting to make his mark in increasing larger roles. Here he plays Murray Burns, the abusive dancing partner of our heroine, Peggy. Most of the cast is filled out with a roster of familiar and dependable character actors such as Frank McHugh in the ninth of eleven pictures with pal Jimmy. Donald Crisp is a fatherly fight manager instrumental in Danny's success and his greatest heartbreak. Lee Patrick, Joyce Compton, George Tobias and Jerome Cowan add much to the flavour and depth of the movie. One conceit of the screenplay alternately annoys me on some viewings or comforts me on others. I believe it is an attempt to capture the scope of the novel that they have given the film a narrator in the form of an "Old Timer" played by Frank Craven. He travels the streets, introducing the characters and, apparently a timeless tramp, pops up again at the end to wrap things up for us. The role is not dissimilar to the Stage Manager Craven so famously played in Thornton Wilder's Pulitzer Prize winning Our Town. Success, at tremendous costs, comes to both Danny and to Peggy, but that success keeps them apart. A guilt-ridden Eddie looks for shortcuts in his musical career to help his self-sacrificing older brother. Unprincipled racketeers destroy Danny's eyesight. Googi gets too big for his britches. Peggy comes close to starvation. Can you see a happy ending out of all that? Warner Brothers could and, apparently, that may come close to explaining James Cagney's dissatisfaction with the film. 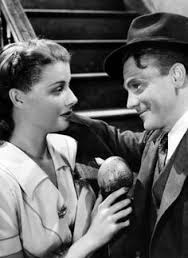 However, from the point of view of my teenage self in front of the television at midnight or the adult choosing a DVD for an evening's entertainment, I cannot not imagine leaving Peggy and Danny (you are to blame, Mr. Cagney, for being the actor you were) without that glimmer of hope for their future happiness, no matter how small. It catches in my throat and brings unbidden tears. If that is trite, I will take it. 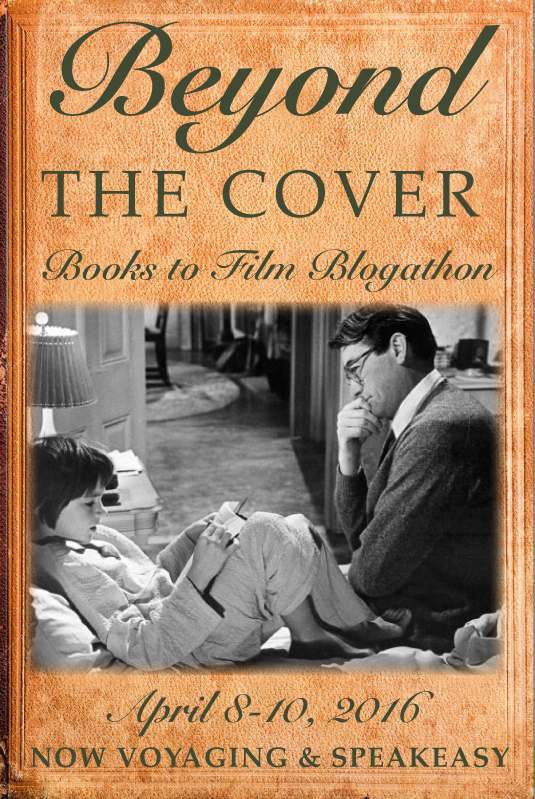 Many thanks to Liz of Now, Voyaging and Kristina of Speakeasy for hosting the Beyond the Cover blogathon running April 8th, 9th and 10th with daily updated links to contributions. I always liked this film though it always felt a bit short of greatness. 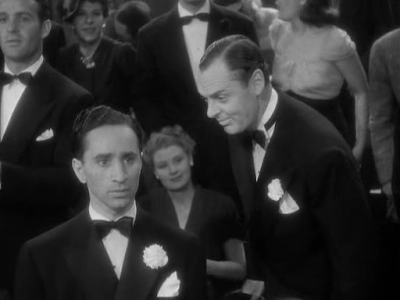 Of course it has Cagney and Sheridan, so it always remains entertaining. The book actually sounds like it covers a lot more territory and social significance. The book indeed is more far reaching than the film. There are rich characters, shown to be just as trapped by their means, and an ambitious landlord. Everything weaves together to create the city that is never conquered. Lower East Side is prominent as is Brooklyn, where renters are taken advantage of in an effort to "move up". It is one of those sprawling novels with much to keep track of. I've not read the book or seen the film, but I'm going to rectify both after reading your review. I was surprised by Cagney's comment, and sorry to hear how disappointed he was. I hope the author took some comfort in his letter. I am surprised that Warner Brothers didn't get Kandel to adapt his own novel. Despite the things we love about our classic movies, the ways of the studios often leave us shaking our heads. I can't imagine how frustrating it would be for a writer to hand over your material to a studio, only to see them butcher it. Would certainly leave a bad taste in a person's mouth, no? As a Hollywood vet I imagine on one hand Kandel could take it in stride, but when it is what many consider your best work, it must have rankled. Well done, as usual. I've not read the book, but it is always fascinating to learn what the actors thought of the script, and then what they thought of the final cut of the movie. It is always a shock to discover they did not have the emotional investment in the movie in same way we do when we watch it. The movie remains a favourite for me. Warner Brothers knew what they were doing, knew their audience and in this case - well, they knew "me". I was unaware that this was based on a book. Must have missed it in the credits. Good review. I think I'm ready to watch the movie again. This blogathon is adding a pile of books to read as well as movies to watch. I know! My watch/read list is getting out of hand. Deep breath and one page at a time. I think actors always see their own films differently then those of us in the audience. I guess it's a good thing when they don't watch their own pictures. After all, stage actors never get to sit in the audience to see themselves act. Once again you introduced me to a new film title ( and a new book author! ) but I must have been away from your site awhile, did you fire the Pink Panther? Your walls are no longer painted pink! I have such a fondness for some movies that it is almost unimaginable that someone involved with it doesn't share the feeling. Once you put your art out there, it is no longer yours - it belongs to the public. I can't afford the new furniture I want so a couple of days ago I looked around at what I could redecorate and - aha! - here it is new walls, cushions and all. Great posting - I'm so glad you went to the novel to see what changes were made. I'm another one who really likes City for Conquest and think Cagney is wonderful in it even though he was dissatisfied with the finished film. I'd like to see Ann Sheridan's character given more screen time, but she is excellent too. I've only seen the cut released to cinemas which completely removed Frank Craven as narrator - I've read that this is one of the reasons Cagney was so disillusioned with the film. I used to have this on VHS, I think, but have been meaning to revisit it and try to get hold of the restored version which has the Craven sequences added back in. Looks as if it is now on DVD and available for streaming in the UK, so I should be able to do that soon! Just did a quick bit of Googling about the Frank Craven role, and I see his character was in the original release but almost all his scenes were cut out for a rerelease in 1948, which was then the version issued on home video. So I must be remembering wrongly about this being one of the things that annoyed Cagney about the original film. Apologies for that! It appears that the studio executives couldn't make up their minds about Frank Craven's hobo/narrator either. If anything, what that shows me is that everyone involved in the film cared about what they were doing and tried to get it "just right". It is simply that that were too many ideas of how to do that. As I said in the post, I still go back and forth on whether Craven's bit works or not. I do know that I will always enjoy the film. Agreed, I'll always enjoy it too. I've actually just watched Craven in Our Town, by total coincidence - I'm covering it for the upcoming William Holden blogathon - so am all the more intrigued to see his bit in this! I'll look forward to your piece on "Our Town". I adore Thornton Wilder. I like this movie a lot too, and as other commenters said, I was unaware this was a book, and also such an important work in such a good screenwriter's career. Interesting to read the comparison. Luckily for a novelist, no matter how bad a film turns out, their original vision still stands and remains available. Thanks so much for joining the blogathon! Always a pleasure to have you along! My pleasure. There have been many eye-opening contributions to your blogathon. You and Liz must be very proud. It is a book well worth reading. I couldn't find a print copy, but it recently became available for Kobo and it was a constant and welcome companion. This is one of my favorite Cagney films - and the one that made me fall in love with Ann Sheridan. They were dynamite together - his best female costar, I think. And that ending - makes me cry every time! Thank you for this awesome review. The book is always one I thought about reading, but now it's on the list of things to read. The movie will never leave my heart. I would like to see some farsighted producer make a mini-series of the book. It would be fascinating and bring the novel back in the public's eye. I remember the passage from Cagney`s autobiography, but I haven`t seen the movie yet! I want to do it, of course, but now I want to read the novel as well. I love to compare the book and the movie, and it`ll be a nice experience, knowing filming wasn`t always smooth and Cagney w2as unhappy with the result. I was able to get the book for my e-reader and I was very happy to read it after all these years. It is excellent. I just bought this movie on a whim and haven't seen it yet! Now I am super excited too and I had no idea it was a book! Thank you so much for joining us! My pleasure. Congratulations on a grand blogathon. There is an awful lot about the movie to love. After all, it stars James Cagney!